1. Place all sauce ingredients in saucepan. 2. Heat until honey and sugars are dissolved, stirring occasionally. 3. Cook for about 5-10 minutes more or until blueberries have cooked down. Smash them a little with the back of a spoon after they've cooked down a bit. 4. Remove from heat and allow to cool while preparing the chicken. 3. In a large skillet, sear chicken on both sides over high heat in 1 tb olive oil until browned. 4. 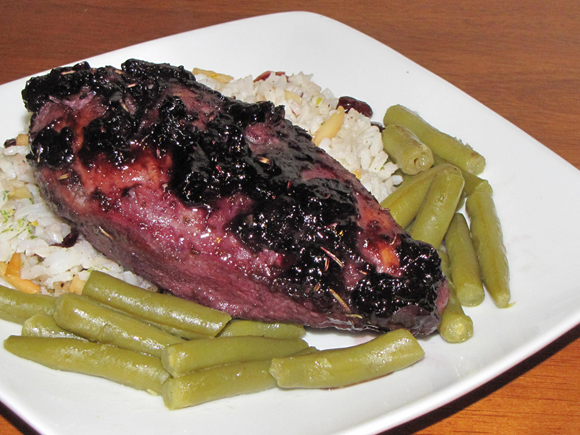 Place side by side in a greased 1 1/2 qt baking dish and spoon the blueberry sauce over the chicken. 6. Bake chicken for 30 - 40 minutes, or until cooked through (165 degrees). Spoon the sauce over the chicken a few times while it cooks.